You’re here because you want to learn how to style a bob, right? Keep reading for some of the best tips on how to get this look. I’ve had my hair cut this way many times before (although right now I’m doing an experiment to see how long I can grow it out) and there are certain ways to style a bob that helps give it some volume and get the most out of this fun cut. I love this look on Cameron Diaz in the picture above. It’s probably one of my favorite cuts on her because she looks so fresh-faced and it frames that beautiful face of hers. Not to mention how it makes her cheekbones pop! There are many different kinds of bob haircuts, from a blunt cut and asymmetrical to straight and ones with some waves. My goal was to find tutorials and pictures for several different kinds of bob haircuts so you’re able to find just what you’re looking for. And as always, drop me a comment below if you don’t see a hairstyle idea (pictures or tutorials) that you need. I’ve had several requests for how to style curly hair, so that’s coming up soon! 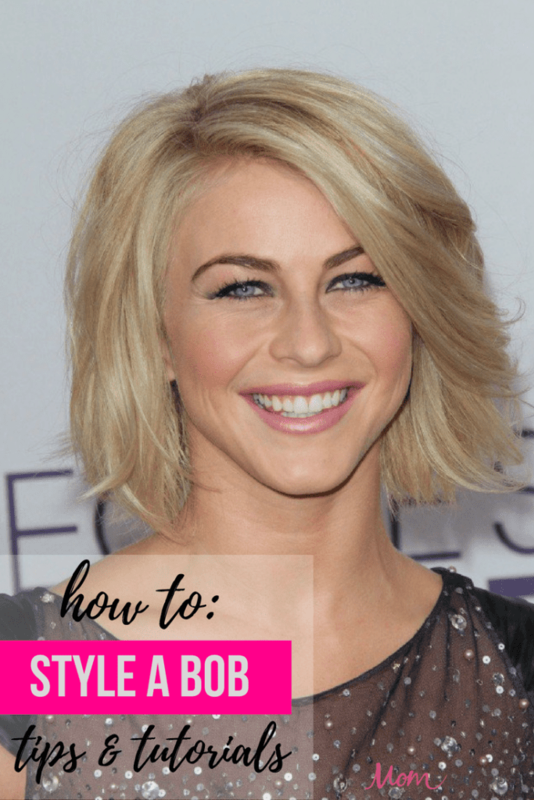 Alright….let’s learn how to style a bob, shall we? Here are some picture examples and a video tutorial on how to style a short bob. In the tutorial, she recommends using a 1 1/4 to 1 1/2 inch curling iron and I agree! I used a 1 1/2 inch curling iron to style my short bob when I had one and found it gave me just the volume I wanted. She also used a teasing brush for more volume and to keep her hair from deflating during the day. Because her hair is on the dry side, she didn’t use hairspray to set it but used a heat protectant before curling it, which helped protect her hair, but also give it some hold. Here are some pictures of short bobs. This tutorial shows how to style your bob if it’s one length and doing it with a flat iron. She used the Irresistible Me Diamond Hairstyler. She used the flat iron to curl the ends under, as well as to give it a little volume. She also recommends teasing at the crown for more added volume, using a round bristle brush. Here are some examples of bobs that are a little longer. This is one of my favorite ways to style a bob. As celebrities like Jennifer Lawrence and Anne Hathaway have shown, it’s perfect enough for the red carpet or an everyday look. In this video tutorial on how to do messy waves for short hair, she preps her hair with a serum, which can be used on dry or damp hair. After applying the serum, she blows her hair dry and uses her fingers to get under the roots for some added volume. I use the Infiniti Pro by Conair 3Q Styling Tool to dry my hair and love it. It actually won out over my $400 hair dryer! I talk about it in more detail here. After her hair was dry, she put in a hair paste to help give her hair moisture and hold. It also helps with molding your curls just how you want them. I had never used a paste before until I saw this video and I’m now a fan. Because of the paste, I didn’t have to finish it off with hairspray and it gave my hair a beautiful shine. This one is perfect for creating messy waves with hold. To get her messy waves, she uses a curling wand and makes it look so easy! If you’ve never used a wand before, just realize it takes some time to really get the hang of it. In between curling her hair at the crown, she used a teasing comb for some added volume. I love how her hair turns out! Here are a few pictures of a wavy/curly bob.